If you have not already found Bee Blessed, let me introduce you to the brain child of Sarah and Judith. Bee blessed is a monthly quilting bee based in N. Ireland with the purpose of creating quilts for local needy people/families/groups. Many of you, our guild members, have been asking to create donation quilts as part of our 2014 activities. With such a wonderful organization as Bee Blessed at our doorstep, it only makes sense that we combine efforts. After a quick chat with Judith, we decided to bring Bee Blessed to the MQG as our guild's mechanism for making donation quilts. 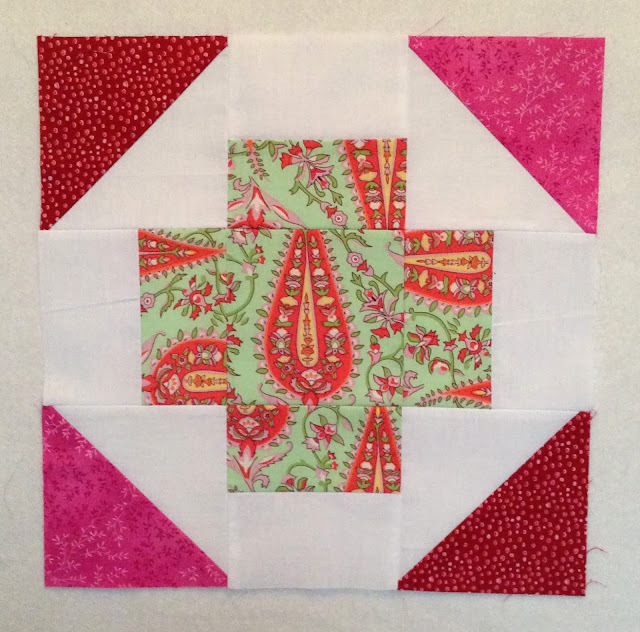 This month, Sarah has requested Greek Cross blocks from this tutorial. There are no restrictions in color (beyond being generally monochromatic in focus fabrics and white as your background) so this is a great block to create right from your stash. Your time and effort will be greatly appreciated when the quilt is donated to someone in need. Please contact Judith directly if you are interested in sending blocks onto her. To learn more about Bee Blessed, hop over here and/or join in their flickr group.